• American Association of School Libraries (AASL) with its Independent Schools Section (ISS) offers ongoing professional support and development, as well as national standards and guidelines (Standards for the 21st-Century Learner in Action). AASL and ISS have listservs and wikis that regularly ask and answer questions posed by members, questions ranging from the philosophical to the mundane. • The Association for Independent School Librarians (AISL) is a smaller group specifically focused on independent schools and their libraries, and which also offers a listserv, a Ning and an annual conference that visits independent school communities around the country. • National Association of Independent Schools (NAIS) is the umbrella accrediting organization for many non-public schools. International Association of School Librarianship offers the same sorts of support internationally. • Most states have a school library association as part of the state library organization. • In Texas, for example, the Texas Association of School Librarians (TASL) advocates for school library funding at the legislative level. • New England School Library Association (NESLA) combines the efforts of the local affiliates within all six of the New England states. • There are local independent school library groups all over the country that work together to support best practices and advocate within the community for excellence in the libraries. Look at the web page associated with this book for a more complete list. • In Houston, we have the Houston Area Independent School Library Network (HAISLN). • International Association of School Librarians (IASL) provides an international forum for those people interested in promoting effective school library media programs as viable instruments in the educational process. ALA released a new web resource to help school and public library advocates articulate the positive, transformational impact that public libraries and school library media programs have on the lives of children and teens. This online tool gives top-level talking points, statistics to back them up and links to the bodies of research. KnowledgeQuest, published bimonthly September through June by the American Association of School Librarians. 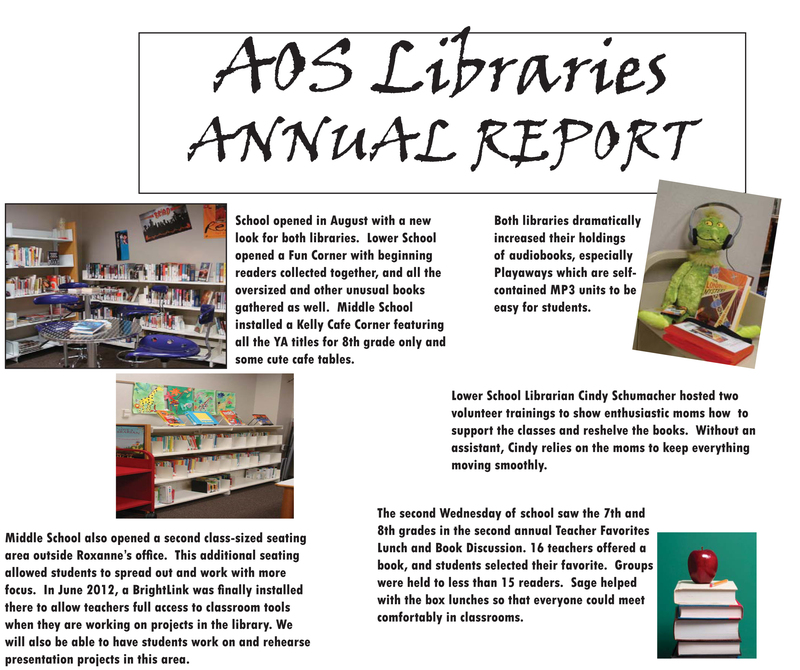 School Library Media Research, AASL’s refereed research journal. John Pecoraro “What’s It Worth? The Value of Library Services as an Advocacy Tool.” (pdf), Texas Library Journal 85.1 (2009): 8-9. American Association of School Librarians. “ISS Resources.” A Student and Parent’s Guide to Evaluating Libraries in Independent Schools. 2009. Maine State Library. "Maine Values and Explanation for Library Use Value Calculator." Maine State Library. Maine.gov, 2005. Web. 23 Nov. 2009. “AASL Advocacy Toolkit.” AASL. 2009. 27 Mar. 2009. Hamilton, Buffy. “Creekview High School Media Center Annual Report.” 29 May 2009. Pdf file. Hand, Dorcas. "AOS Annual Report 2011-2012", loosely modeled on Buffy Hamilton's model above. I grew up the daughter of independent school teachers, and attended or was librarian of seven independent schools ranging from Florida to Massachusetts and now Texas. My library career has included three schools and two public libraries, as well as a tour as editor of SLJ’s Adult Books for Young Adults. I have been been active in ALA/AASL/ISS and TLA/TASL (Texas) since 1978. 2009-10 is her twentieth year as Director of Libraries at Annunciation Orthodox School in Houston TX. If you were a school librarian about to lose your job, what would you do? If you are a Teacher-Librarian, how can you convince teachers to collaborate with you to build assignments with strong information skills imbedded? What if instead of those massive cuts you must convince the Board that you need a new multi-million dollar facility? For another perspective, if you are a Head of School facing massive budget cuts, why should you not shrink or eliminate your library program? The answers to all of these questions involve advocacy. In independent schools, the library staff has a much more direct and immediate connection to all stakeholders including the Board of Trustees. The smaller bureaucracy allows us to effect changes more quickly than in public school districts with many layers of hierarchy. We not only teach in independent schools; we work independently in collaboration with our administrators, faculties, parents and students. This immediacy is a gift we appreciate frequently. It is also a responsibility: independent school librarians must continue to be consistently responsive to the needs of the students and faculty of our schools. How can we be the strongest possible advocates for our students? That can be restated as “How can we be the strongest advocates for our programs?” The rest of this book discusses in depth many ways a library helps its students and its school. This chapter will discuss what advocacy is and how advocacy overarches every activity of the library to help the students and their school. WORKING DEFINITION OF ADVOCACY: an ongoing program of collaboration with the goal of ensuring that the school community is fully aware and reminded regularly the library’s strengths.